ALL ENGELHARD is pleased to welcome visitors to our SilverTowne L.P. Definitive Page. While our focus is clearly Engelhard, we recognize that many Engelhard bullion collectors also collect other bars and ingots. As such, we appreciate the opportunity to present important bullion information and look forward to your thoughts and input. 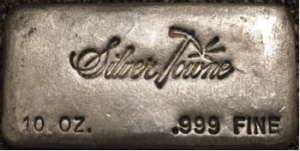 SilverTowne LP was founded in 1949 by Leon Hendrickson, and grew from a small coin shop to become one of the largest retail bullion and precious metals dealers in the country. 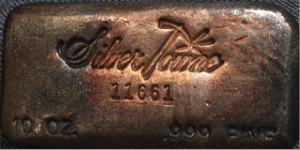 What most folks don’t realize, however, is that SilverTowne produced a very limited and relatively short-lived run of poured silver ingots beginning in 1973, mostly serialized, that are just now gaining attention in the collector world. 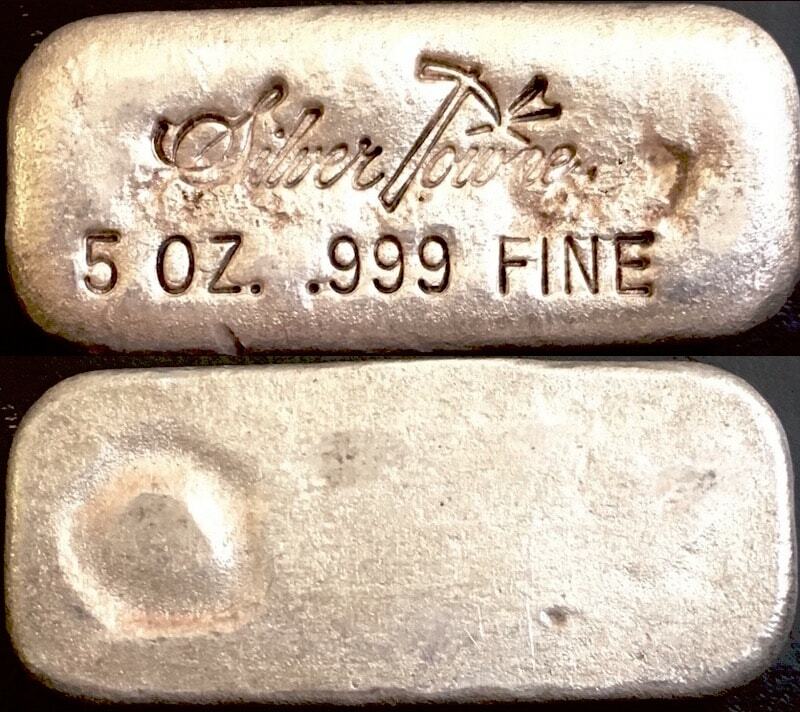 Today, SilverTowne Mint produces what we call “retro” ingots in 5oz, 10oz, and kilo weight class that in many ways resemble the vintage ingots shown below, but without serial numbers. We often field inquiries from collectors regarding these newer examples, as they often confuse them with vintage pieces. The giveaways to us are the newly poured complexion, cooling bubbles and uncharacteristic surface texture compared to vintage ingots, and the lack of a serial number. Examples can be found on the SilverTowne.com website and often on Ebay. 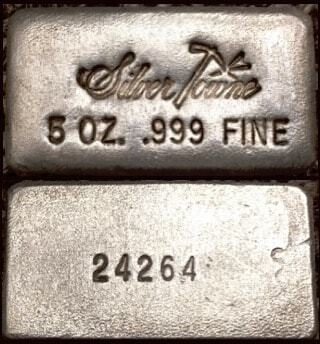 1st series 5oz class ingot produced by SilverTowne. 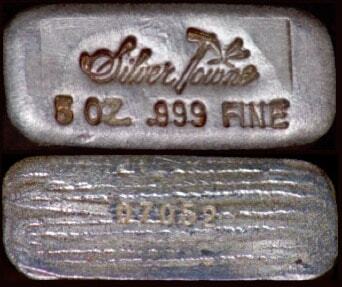 Ingots of early serial number assignment demonstrate a plain reverse while ingot 10068 demonstrates a lined reverse. 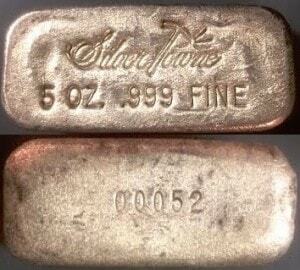 The serial number assignments for these 1st series ingots were random throughout the range. This 1st series ingot measures approximately 52.39mm x 19.05mm. Size differences between all three series are demonstrated in the photo below, with 1st series being decidedly more wide than the others. [SilverTowne Hallmark] [5 OZ.] 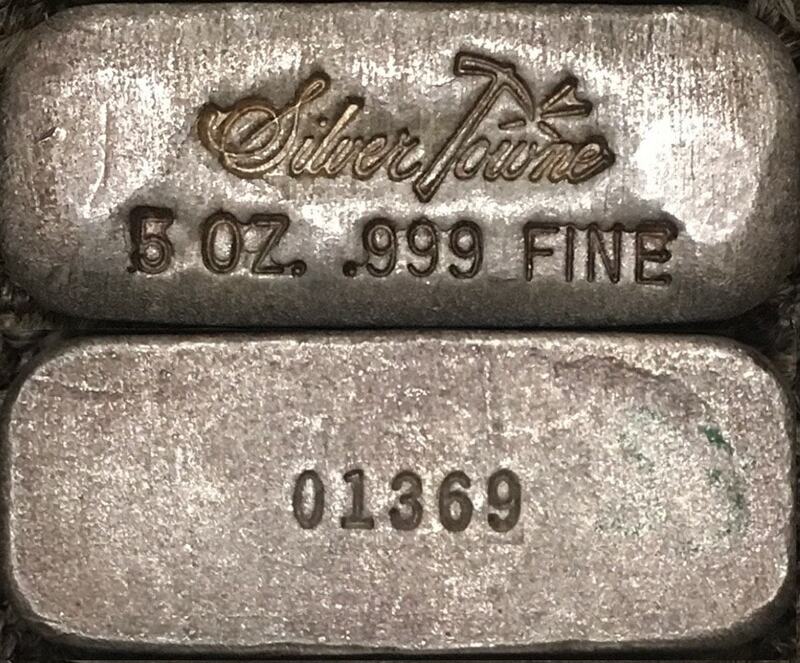 [.999 FINE] [Serial Number Assignment] 2nd series 5oz class ingot produced by SilverTowne. 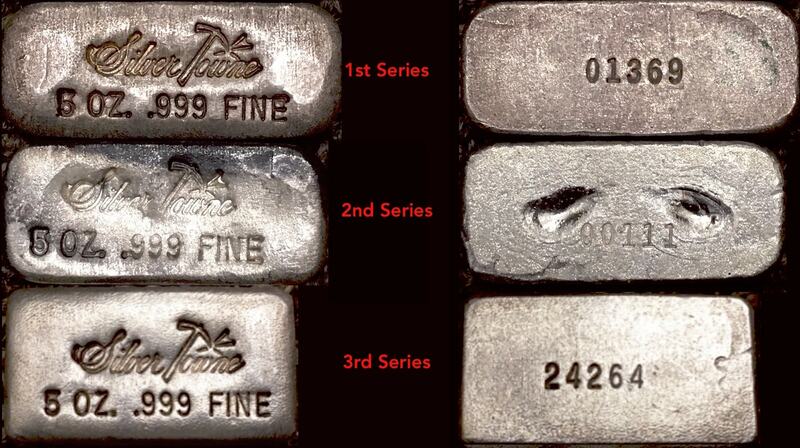 These ingots were produced in both lined-reverse and flat-reverse throughout the serial number range, both pictured. This 2nd series ingot measures slightly narrower than the 1st series, at approximately 49.21mm x 19.05mm. SilverTowne used many slightly different casting moulds and cooling trays in their production of these ingots. In an All Engelhard case study of 100 2nd series ingots, we found 30 examples with inverted serial numbers of random serial range assignment. This suggests the inverted serial assignment was perhaps a production oversight, though not terribly uncommon. Mintage estimate on these inverted serial number examples is <2,250 of the total <7,500 produced. 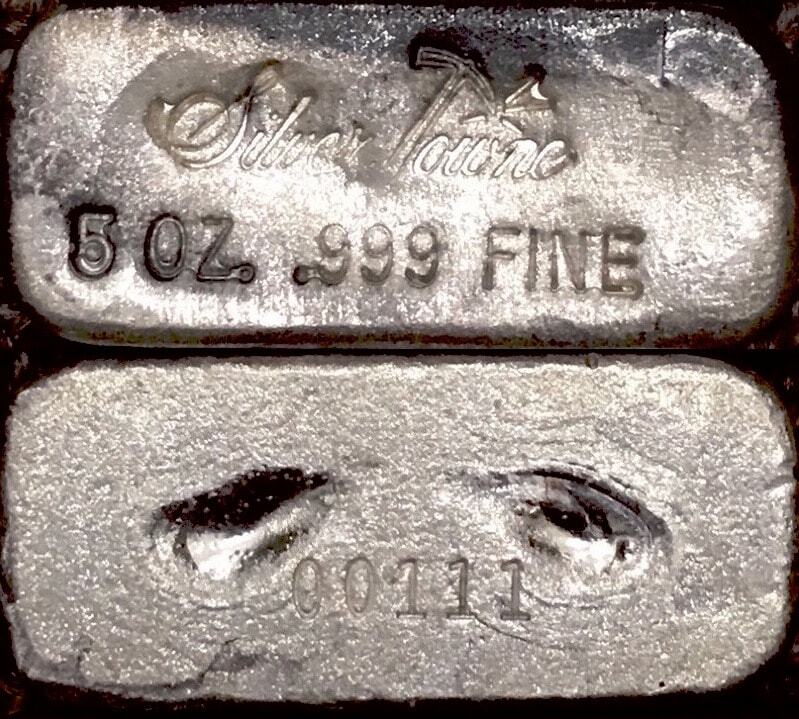 It is rumored that three  5oz class ingots were erroneously stamped with serial number on the obverse, while the hallmark, weight class and purity stamps were placed on the reverse. 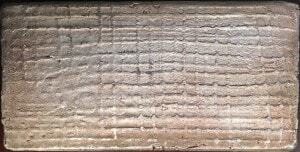 This is demonstrated in the photo of ingot 00052, below. 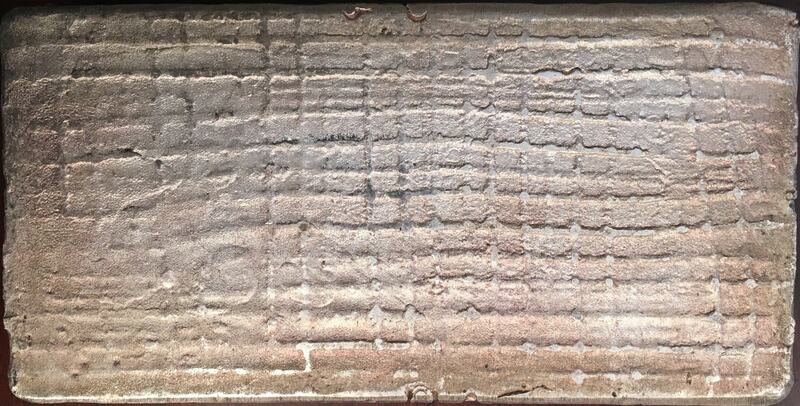 Ingot 04813 has also been documented to show this reverse stamping anomaly. 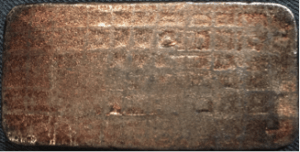 It is also rumored that a few 10oz class ingots were stamped in similar variation, though we have not yet observed such an example. [SilverTowne Hallmark] [5 OZ.] 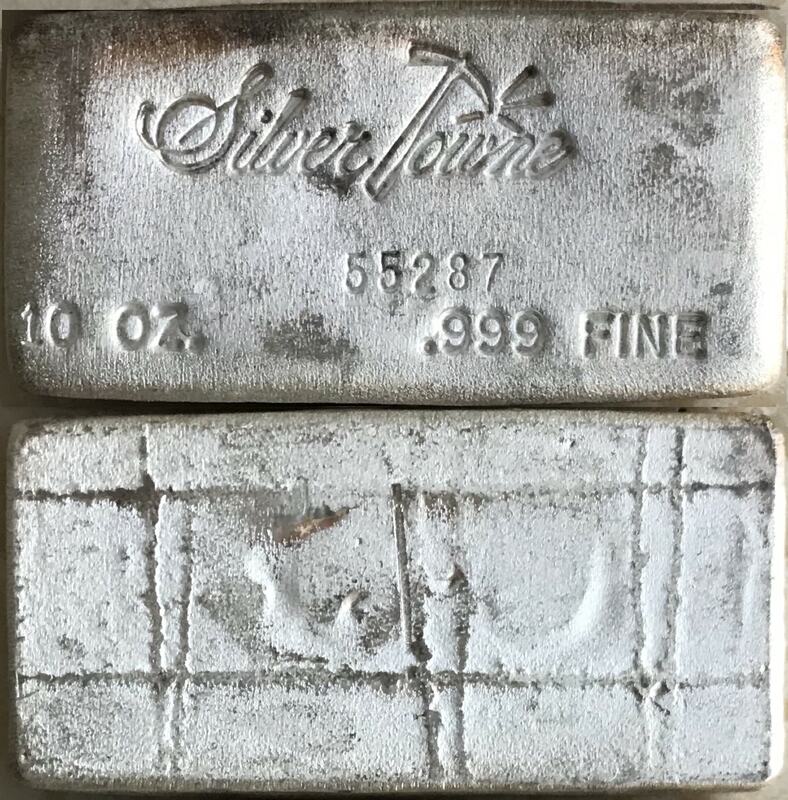 [.999 FINE] [Serial Number Assignment] 3rd series 5oz ingot produced by SilverTowne. Demonstrates a plain reverse with serial number assignment and is the most narrow of all three series. Estimated serial run of 18000-29999. 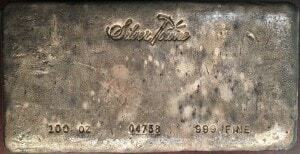 [SilverTowne Hallmark] [Serial Number] [10 OZ.] 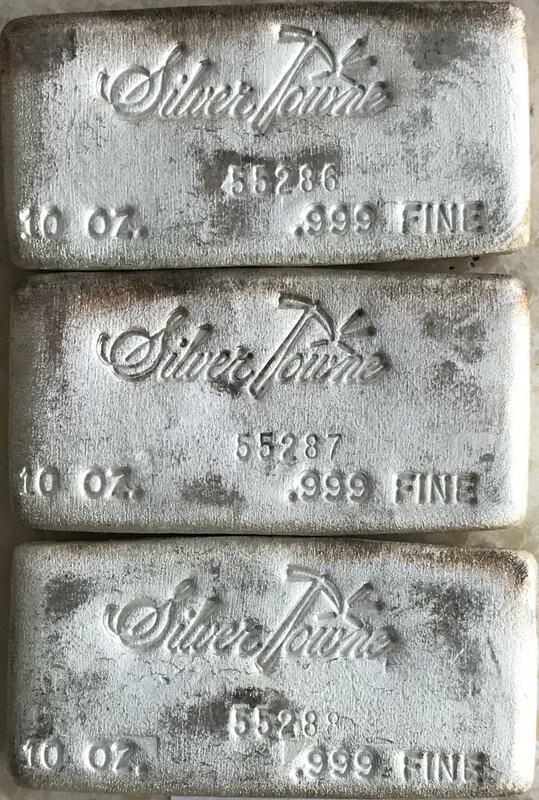 [.999 FINE] Cast Finish 1st series 10oz class ingot produced by SilverTowne. Demonstrates a waffle pattern reverse, which varied throughout the production run. Estimated serial run of 00001-65999.